It’s happened all of us at some stage – driving between jobs and being ambushed by the sound of the toolbox cascading its contents all over the floor of the back of the van, and then having pick up the pieces of our equipment, which are now spread across the floor of the van. This however, is becoming more and more of a rare occurrence as more and more business van owners are turning to customising the interiors of their vans to give themselves the storage convenience of a workshop all contained in the back of a van. Kits, construction guides and pre-built storage vans are all readily available in the market and can help in transforming your van from simple A-to-B transport vehicle into a mobile workshop. The question is how do you go about this? How to you get extra storage and a mobile ‘workplace’ out of your van. No matter what you do to add extra storage space, it is always advisable to inform your van insurance provider of any changes or modifications you make to your van. Not disclosing this information may affect you if a claim is made against your van insurance. The great news for tradesmen is that a lot of vans are very similar in size and shape – there is almost a standardisation in the selection on the market between small, medium and large vans. This really opens up a whole world for customising your van’s storage space to suit your needs based on storage ‘kits’ that already exist in the market, no matter what your trade or business is. As a result of this you have a couple of different options – you can either buy a van pre-fitted with storage units and shelving, or you can install storage yourself from a kit and customise it along the way so that it works for your particular needs. 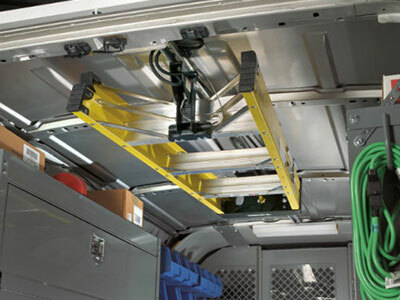 The second option is the most beneficial for any van owner in the long term, as it allows you to create the right kind of storage for the type and amount of equipment you have – there’s no point in having space filled with storage drawers if you typically carry more power tools than small hand tools and accessories. It also allows you to fit a relatively inexpensive kit to your van, customising along the way – there are plenty of guides available online to help you customise and build your own storage, giving you comprehensive detailed advice, and step by step instructions on how to create the perfect storage space of any kind inside a van. One thing to note is that if you do make any changes or customisations to your van you should inform your van insurance provider. Any and all information that you can give to your insurance provider will help speed up and processes in the event of a van insurance claim. Finally, a DIY storage job lets you choose a van you like and can afford – allowing you to buy used, helping reduce your costs even further, and leaving more budget to play with to put tools and customised storage in it! No matter which route you go down, pre-built or creating your own storage and racking, the tools you use and transport are going to dictate the overall arrangement of your storage. They will have a big influence on what kinds of storage you will and won’t need in your van. An example of this would be builders who use heavier tools or even plant hire firms that work with specialist equipment. They will require fewer but larger storage spaces in order for their equipment to be secured safely and securely. Some van owners have also made use of a ‘false floor’ which can be used for the storage of smaller tools under heavier and bulkier equipment. Compare this with handymen, small-time building contractors or electricians who will likely need much more drawer and cabinet space with space for smaller tools and individual components, as opposed to large storage spaces. Floor space was quickly mentioned in the previous paragraph, but the importance of utilising these ‘hidden’ spaces cannot be understated enough. More often than not these spaces are overlooked when they can in fact be used as storage spaces. No matter how spacious the interior of your van looks, you’ll soon notice how precious and valuable space becomes when you start installing shelving, racking and cabinets. This becomes even truer if you carry even a handful of large, heavy tools; these quickly use up space which could be used for shelving, drawers or other racking. A solution to this is to use roof racking and ‘false floors’ to create additional space. These areas of storage are great backups, but are also essential for long and delicate tools which require safe, flat storage – for example, saw blades and larger spirit levels suit ‘false floor’ storage perfectly, whereas heavier yet more compact tools like dust extractors can easily be lifted to higher spaces like taller shelves or roof-level storage spaces. 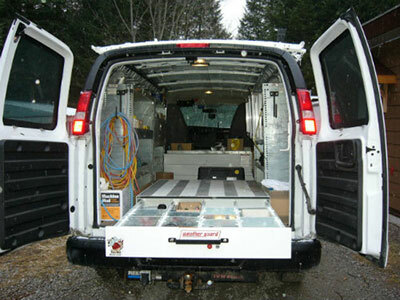 Now that you have all this extra storage space in your van you can fit more tools in. All you need to do now is make sure you have the right insurance cover for your tools. Insuremyvan.ie is able to include tool cover onto your van insurance policy, just make sure you mention it to one of the team when you are speaking to them about your van insurance. 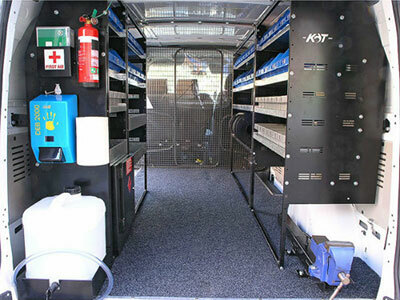 Have you got specific storage spaces, either pre-built or custom in your van? How do you store your equipment while in transit between jobs? Let us know and show us some photos on our Facebook and Twitter, using the hashtags #IMV & #VanStorage. Whatever kind of van you drive, Insuremyvan can save you money on your van insurance. Get your van insurance quote and see how much you can save.